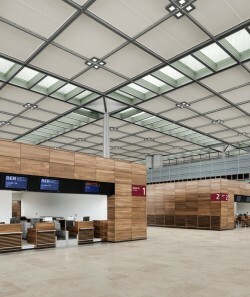 Lindner has built a worldwide reputation of quality and excellence as a manufacturer and installer of high quality interior products such as Airport Perforated Metal Ceilings, Raised Floors & Facades, Wall Claddings and Airline Lounges. Since 1965, Lindner has been involved in the design, fabrication, supply and/or installation and project management of interior fit-outs. With our financial strength and international references together with worldwide production facilities we offer reliability to our partners. Together with our own R&D department and a specialist team dedicated to the requirements of airport terminals, lounges, shops and offices, our designers create solutions for the client’s individual needs. Lindner is not only one of the market leaders in the field of complete interior fit-out but also for the supply only of our interior products worldwide. Airports combine outstanding functionality with modern architecture. The Lindner Group develops project-specific solutions to meet your exacting requirements. A modern, sophisticated architecture combined with outstanding functionality is what turns airports into unique projects. Through detailed planning and implementation we erect iconic buildings all over the world. Hong Kong International Airport Chek Lap Kok and London Heathrow are amongst our most important references. 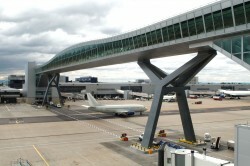 For London Heathrow Airport Lindner supplied and installed products at almost all terminals e.g. metal ceiling systems, facades, glass wall claddings, partitions and blast-enhanced building products just to name a few. The largest contract on Terminal 5 was worth more than 130 million Euros. Lindner realises your individual requirements into reality with customised, high quality and environmentally friendly products like metal ceilings, partition systems, wall claddings, floor systems, lights and lighting systems. To download the Terminals and Stations Brochure click here. One of Lindner’s key strength is the interior fit-out of passenger terminals around the globe. We can realize your individual requirements into reality with customized, high quality and environmentally friendly products like metal ceilings, partition systems, wall claddings, floor systems, lights and lighting systems. A good example for the capabilities of Lindner in the Airport sector is Berlin Brandenburg Airport. Lindner supplied and installed products like genuine non-flammable wood veneer panels called “Firewood”, raised floors, ceiling systems, shops facades, glass sliding wall panels, partitions and specific built-in furniture just to name a few. With the execution of the Lounges this contract was worth more than 50 million Euro. The business division Lindner Steel & Glass completes our portfolio for building envelopes. Together with Lindner Facades and Lindner Roofing Systems we can now offer single source solutions to our clients. The specialist English facade company Schmidlin (UK) Ltd. has been part of the Lindner team since April 2006. The former subsidiary of Schmidlin AG Fassadentechnologie has set new standards in facade technology worldwide over the last 25 years. The Lindner Group‘s building envelope specialists at Prater Ltd, Surrey UK, has decades of experience in designing and installing roofing systems. Air Berlin, British Airways, Cathay Pacific Airways, Emirates Airline, Etihad Airways, Japan Airlines and Deutsche Lufthansa AG are amongst Lindner’s client base. The lounge projects are handled as turnkey or single package solutions just as favoured by the client. Lounges are very multifaceted places. From rather quiet places and relaxing zones to lively amusement zones suchlike bars, every airline and airport aims to achieve a comfortable place for their lounge visitors. 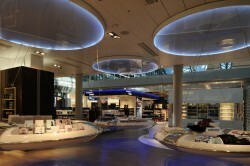 Lindner’s interior products for lounges e. g. metal ceilings, partitions, floor systems, furniture etc. can not only be delivered as an eye-catcher, together with our innovative integrated technologies such like heating and cooling as well as lighting, the atmosphere of the room can be adapted for maximum comfort. An execution time of very tight duration and works during daily operations is the main challenge but can easily be handled with complete solutions – and on top – secures the very best service for your project. Trust in many years of Lindner’s experience in the fit-out of shops and offices. Whether you are aiming to attract customers by visually pleasant shop fronts and interior design or if you want to achieve discretion in your office rooms using acoustically highly effective solutions, Lindner is your strong partner. Download the Lindner Terminals and Stations Brochure today!